It's already March! In old days, March was called "Yayoi" (Pronounciation; Ya-yoi /Yay-oi) in Japanese, meaning "Growing more" or "New life." Because of this good meaning, the word "Yayoi" has been popular for Japanese girl's name who were born in March. I think this given name is familiar to some of you, and I know some Yayoi-san..
Nowadays, names of the months are simply used by numbers from one to twelve in Japanese (For example, January is called "Ichi-gatsu", meaning "the month of one," ) but traditional names are still in common, especially for letters or poetries. In western cultures, as you may know, names of the months are named after Latin numbers and some months were named after Roman/Greek Gods. However, because of the appearances of two outstanding Romans in the history, names were changed; The founder of Roman Empire changed the name of the month of 7 into July after Julius Caesar, and then the month of eight were changed to August after his name, Augustus. Therefore, September (meaning "the month of 7") became the month of "9" and October (meaning "the month of 8") has become the month of 10. So are November (the month of 9) and December (the month of 10). This time, I took some time to make the following list of both English and Japanese names of the months... because I couldn't find the web site to cover both English and Japanese names of the months. Though it was nothing to do with Buddhism, but it was very interesting to know both origins of the months. And I hope this will be interesting for you, too. Month of Janus, who is a God of gate. Janus in Latin means gate or doorway. Month of "Fellowship." 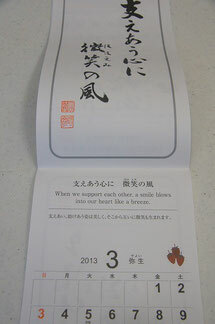 睦 means harmony affection and 月means moon or month. Month of Purification. Februere* (Latin) means "Purification." "Februs" means "to offer Wine to gods." Month of "Wearing more Clothes." Month of Mars, who is a Greek God of War and agriculture. Month of "Aperio," which is a starting year of all the plants. Month of "Maia," who is a Goddess of Growth and prosperity. This was also the month to mourn. Month of "Planting rice early." Month of Juno or Junious who is wife of Jupitor, Roman goddess. **Some insist, it means "Month of plenty Water"
Month of Julius Caesar (100BC-44 BC) who was a Roman General. Month of Augustus, Gaius Octavianus (63BC - 14AD) who was the first Emperor of Roman Empire. Month of "Seven." Septem (Latin) means 7. Month of "Eight." Octo(Latin)means 8. Month of "Nine." Novem (Latin) means 9. Month of "Ten." Decem (Latin) means 10. By the way, every Yayoi-san I know is very nice! But one of the nicest Yayoi-san I've known well, was not born in March, but in November! Did you know why? It should be very interesting but that's enough for today (I 've gotten tired.) Maybe,in the future, I will talk about it in the relation of Asian Cultures.